Ald. 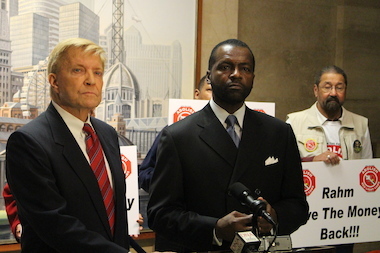 Bob Fioretti and WVON-AM host Mark Wallace, director of Citizens to Abolish Red Light Cameras, which is backing his mayoral candidacy. DOWNTOWN — A self-proclaimed "Ban the Cams" coalition is supporting 36 candidates who have signed a pledge to abolish "unfair photo enforcement" of red-light and speeding violations, a list that includes a top mayoral challenger. Citizens to Abolish Red-Light Cameras has a list of candidates who have signed a pledge to "repeal the red-light camera and speed camera ordinances," led by six sitting aldermen: Bob Fioretti (2nd), who is running against Mayor Rahm Emanuel, as well as Pat Dowell (3rd), Leslie Hairston (5th), Roderick Sawyer (6th), Anthony Beale (9th) and Toni Foulkes (15th), all of whom are seeking re-election (although Foulkes is running in the 16th Ward). "The 'Ban The Cams' coalition in Chicago is developing into a potent political force in the 2015 municipal election," said Mark Wallace, director of Citizens to Abolish Red Light Cameras and a radio host on WVON 1690-AM. "With the support we've received from all areas of the city, we are poised to abolish unfair photo enforcement in Chicago this February. "If we want to get rid of these cameras, we need to get rid of the politicians who voted for them," Wallace added. Fioretti has already made the cameras a campaign issue, as has Cook County Commissioner Jesus "Chuy" Garcia (D-Chicago), another mayoral challenger. Yet, according to the group, Garcia has not yet formally signed the pledge to abolish them, although his campaign said that was a formality. Garcia spokeswoman Monica Trevino said Wednesday that Garcia "is for a moratorium" on the cameras and "will sign the pledge." Others who signed the pledge have dropped out or failed to survive the process of having their petition signatures challenged. The election is set for Feb. 24. The group plans a rally at 10 a.m. Saturday at the Billy Goat Tavern at 1535 W. Madison St., including an hourlong broadcast on WVON-AM starting at 11 a.m.